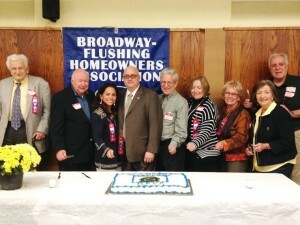 Members of the Broadway-Flushing Homeowners Association recently celebrated the civic’s 50th anniversary. The event was held at the Church on the Hill in Flushing, where the group regularly meets. Ready to cut the cake are eight past presidents and the sitting one, Robert Hanophy Jr. They are John Kearney, left, Robert Hanophy Sr., Janet McCreesh, Hanophy Jr., Mel Siegel, Marianne Giacalone, Sandi Viviani, Anne Mullaney and Arthur Viviani. Homes in the area were placed on the National Register of Historic Places and the New York State Register in 2006.